Comfortable dynamic pilot posture is the principle for steer design and layout of cockpit design, and is used to study on how to improve the manipulation efficiency. 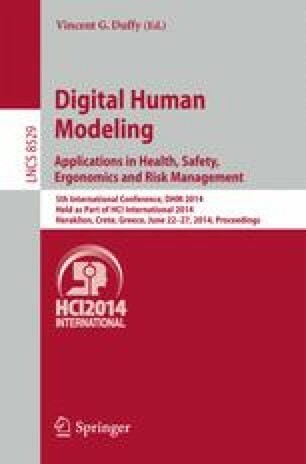 This paper has built a comfort evaluation method considering the consecutive of pilot manipulation based on the static pilot posture, which using the comfort of the dynamic pilot posture to evaluate the comfort of cockpit. The dynamic posture data has be captured by the Measurand@ motion capture system in the cockpit. Then the comfortable evaluation is executed for the pilot postures by fuzzy evaluation method. Form the results, the comfortable evaluation conclusions of cockpit design can be deduced. The better comfortable the pilots have the better design the cockpit is. The result has been validated through the evaluation by JACK software. The conclusion is: the two has the same opinion on the key manipulation equipments, but the new method can analyze the consecutive change of pilot comfort and can discover the interference between pilot and cockpit equipments during the whole manipulation. The evaluation results can instruct the optimization of the cockpit design and improve the control efficiency and flight safety.